...in five minute artisan bread. Now understand me: I'm a sourdough nurturer. I like kneading dough. But I love crusty loaves fresh from the oven even more. A recent visit to Bluestone Farm--where those fabulously locavore nuns I love so much farm and cook from scratch--converted my heart and my tastebuds. On a beautifully sunny day we sat down to potatoes au gratin and a rooster salad (they say he was a mean old bird and his time had come). With Timothy napping on my lap I sopped up extra drippings of melted cheese with a slice of a crusty baguette. When I inquired how they had time to bake this bread every day they revealed the 5-minute technique. I ordered the book a few days ago and with about ten minutes of hands-on time, an overnight chill in the fridge, I woke up Sunday morning (before work) and baked a beautiful loaf of bread. I just baked another one a few minutes ago. It's crazy! Crazy good! Have you tried this method yet? If not, what's your favorite method for getting good, fresh bread on the table? Ninety-six. That's the number of cookbooks my Mom counted in my kitchen bookcase. "There's more upstairs, aren't there?" she asked. I just nodded my head and looked away. What can I say? A few cookbooks a year over 20-something years can add up. And yet, I still hunger for more. Actually, it is fairly easy for me to peruse the cook book display at the book store and keep on walking. I mean, how many renditions of braised lamb shank with pureed celery root does one need? But every now and again, I'll leaf through a book and decide--I've got to have it. James Paterson's latest, "Meat: A Kitchen Education" is one such book. I have to flip through it EVERYTIME I see it. And maybe its ten years of not eating red meat catching up with me, but my goodness, I want to cook every recipe in there. So that's become my standard in deciding whether to add a cook book to my wish list--does it make me want to rush into the kitchen and get busy? If not, I could probably make do with checking it out of the library or doing without. In fact, I should probably catalog my collection and consider lending out the tomes that I never seem to crack open on a regular basis...I'll give that some serious thought. Yesterday's New York Times Book Review had it's annual cook book list--just in time for the holidays, don't you know. Many are delicously inspirational. Others are so pretty and cumbersome, they'd never see any real action on my kitchen counter. But I love knowing what's out there. So what's on your cookbook wish list--and why? I'm so excited about this book! I entered a give away on one of my most favorite blogs, SFGirlbyBay and won! This beautiful and inspiring book by Gayla Trail of You Grow Girl fame is just what I need to get me out of the snowy winter doldrums into springtime seed-sowing and garden planning. I used Gayla's first book and blog when I planted my first-ever garden on Dorset. Now that we are gardening a much smaller plot (read: one raised bed and pots on the front porch and small backyard) this book will help us use our small space productively. And if you want to know why I stay obsessed with the Bay Area, check out Victoria's most excellent blog. Can a book be yummy? I mean, a book that isn't a cookbook? I say yes! Moleskine lovers can use the Passions to neatly collect information and reviews about new recipes, books they read or books people suggest to them, concerts they attend, dishes they tasted, films they see or they want to see, etc, and to share these information with others. Each Journal includes a set of different page layouts, with themed calendars, glossaries, listings, and a core part of alphabetically organized and tabbed pages to fill in. All Passions come with a different series of themed stickers and icons, for page customization. On the back end paper there is a double pocket, for clipping, ticket and card collection. The classic Moleskine elastic band keeps everything closed, tidy and neat. Moleskine plans to roll out Passions next February--a bit too late for holiday gift-giving, but then again, one doesn't really need a reason to get a new journal, right? By the way, this isn't the first attempt to create pocket-sized themed journals. See my review of the version produced by Quo Vadis here. To my knowledge, these still are not available in the United States. 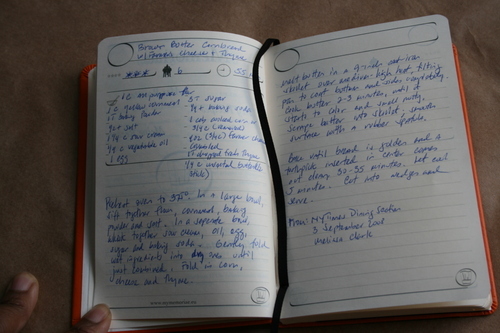 Recipe recorded in a large-sized Moleskine. I learned this years ago when I began keeping my first journal back in elementary school--I'm sure that is where my obsession with paper began. Ever since then, I've been taking and keeping notes to help me remember what I've done and remember what I want to do. I've carried Moleskine notebooks since 2001 but have grown to love so many others too. I currently use a Moleskine for my food writing journal--adapting it to meet all my needs for tracking recipes, blog ideas, wine tasting notes, and places I hope to visit. I use Rhodia pads for shopping lists and for keeping track of messages and announcements for church. Imagine my delight, then, when Quo Vadis--the folks who make the planner I use--announced the debut of the Memoriae series of notebooks--"to keep the memories of your life". Instead of just a blank book with great paper (which can be sublime in its simplicity) Memoriae books have different themes for journaling about those things you love. Books include "My Joys", "My Sorrows", "My Travels", "My Children", and "My Weekends". Needless to say, when I saw that there was one for "My Cooking" I jumped at the chance to review it. 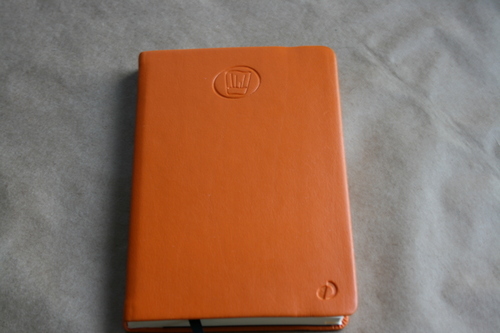 I really do love this book--from its thick, orange faux leather cover, to its size 4"x6" (larger than a small Moleskine but smaller that the regular Moleskine). The chef's toque on the cover denotes the cooking theme. The paper is 80g creamy off-white. The paper seems thinner and more translucent than the birght white Clairefontaine paper I'm used to in other Quo Vadis products but it took my foundtain pens, rollerball, and ballpoint inks just fine--no bleeding through, no feathering, etc. In fact, though I had an issue with being able to see the printed images on the other side of the page--the words I actually wrote didn't show through to the other side. So what else do I like about this journal? The cover is somewhere between a hardcover and a softcover which means it will probably hold up to being tossed around my purse or camera bag. With 224 pages there is plenty of room to keep track of all the recipes I come across in newspapers, the web, etc. There are blank tabs and pages in the back to create notes for whatever I like--I've made one section into "wine notes". If the recipe I record isn't too long, the facing page provides room for notes, anecdotes, that I may want to include--related to the recipe or not. What do I wish was different? The recipe sections don't leave enough room for listing ingredients--you can see where I overflowed into the instruction space. I often cook complicated recipes with a long list of ingredients--keeping them here might not be as practical. I could have used fewer pages for "cooking hints"--but since it's "my memories" I'll feel free to use some of those pages for something else. Overall, I think these are great. If I can get some from Kingston I'd stock up because they'd make great gifts. If you want to see what the "My Joys" journal is like, check out this review. Thanks, Quo Vadis, for the opportunity to review this journal! 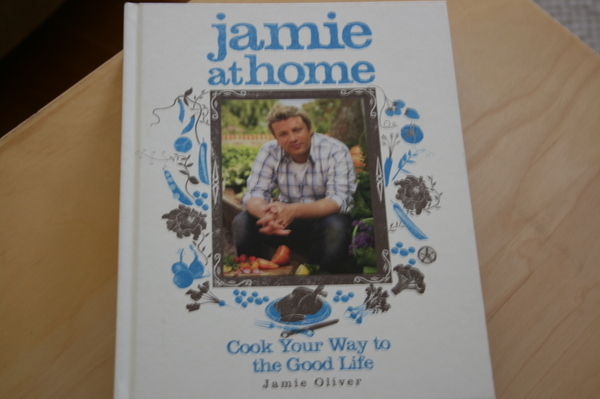 Am I only the one to have fallen in love with Jamie Oliver since he's come out as a locavore? It's been fun to watch him change the school lunch programs in England where he's having a great impact but his latest program, Jamie at Home, has given me a genuine and total crush on the Brit. I LOVE this show. It is no longer running in its Saturday morning slot on the Food Network but that's okay now that the American version of his cookbook has come out. I've resisted buying the English version for months and months simply because I didn't want to play around with metric conversions (I gotta save time somewhere, right?) But if any of you want that one--the Indigo Bookstore in Kingston, Ontario has a bunch of them or you get it from links from Jamie's website. Anyway, this book is all about the way I love to cook--seasonal, fresh, somewhat traditional, and easy. He has wonderful narrative on why and how he grows his food and the recipes are fantastic. With all of my work and travel as of late, I can't tell you the last time I really tore it up in the kitchen--well the drought is over--I can't wait to cook! I ordered my copy from Amazon but you should be able to find it soon at local bookstores. Check out a few page shots below--click on any photo to enlarge. Be inspired. 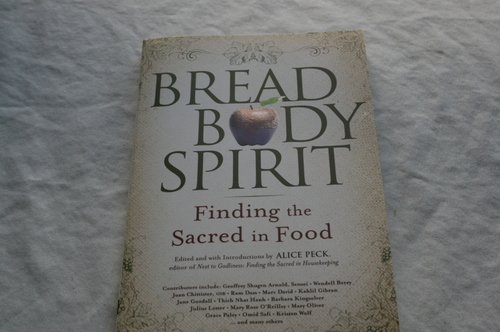 I've had the good fortune to contribute chapters to books in the past but being included in Bread, Body, Spirit: Finding the Sacred in Food gives me unspeakable joy. It is a collection of short essays, poems, and prose spanning the ages with work ranging from the Quran to Barbara Kingsolver. The essays are grouped into themes such as The Garden, Cooking, Serving, Compost, Feasts, Eating, etc. My piece: Lemon Love, about the transformative power of a Meyer lemon tree is in The Garden section. What I'm most proud of, however, is opening the table of contents to find my name listed with such luminaries as Grace Paley, Mary Oliver, Ram Dass and Lauie Colwin. It is a book that celebrates the things I truly love the most--food and the sacred. I can't wait to read it all. Bread, Body, Spirit is published by Skylight Paths Publishing, a small publishing house out of Woodstock, Vermont. You might be able to find a copy at a big box bookstore or even a small independent one. Ask them to order it if it isn't on the shelves. You can also order it here. I won't collect any royalties--I just want to share what I think is a book you'll turn to for inspiration time and time again regardless of your spiritual tradition. Some of you know that I love the Bravo series, Top Chef. Season Four, based in Chicago, kicks off next week and I can't wait. You see, nothing gets in the way of my watching Top Chef and I'm not above admitting that I can quote dialogue from previous seasons. 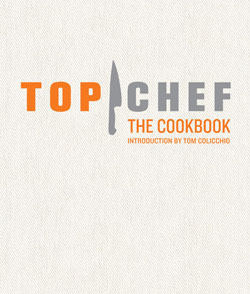 So you know I'm going to be excited to check out Top Chef: The Cookbook being publshed by Chronicle Books. It is scheduled for release on March 20th. It captures some 100 recipes from the first three seasons--I'm assuming they're the tasty ones. You can read more about it here. Ooh, gotta go, they're running Top Chef reruns right now! Archive Alert: On this date in 2006 I was reviewing wine, drinking coffee, and putting out a shameless plug. On this date in 2007 I was talking about Dinosaur BBQ Big Apple style. It isn't that the hot dog did me in. I've been wanting to make this shift for a long time and have only now found the inspiration that is in tune with my life as I live it now. 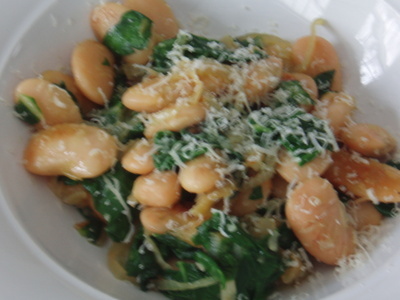 I had heard of Heidi Swanson's book, Super Natural Cooking since before it was published. I've been a long-time fan of her blogs, 101 Cookbooks and Mighty Foods. But after meeting her at the post-Alice Waters/Calvin Trillin talk at the San Francisco Civic Center back in October, it was clear to me that I had to try her latest cookbook, Super Natural Cooking. Heidi immediately seemed like someone I could trust in the kitchen. One of the byproducts of food blogging is a wonderful excuse to try all sorts of new and exciting foods but I've noticed that my diet has become richer and it hasn't helped my waistline. As I contemplated striking a balance between vegetarianism and my current love for grass-fed oxtails, I figured that my diet could only be helped by eating more whole-grain foods. So as the holiday season goes into high gear I've been taking shelter in the comfort of my kitchen. I've tried out Heidi's recipe for giant crusty and creamy white beans with greens (photo above--made with caramelized onions), her espresso banana muffins, and her famous mesquite chocolate chip cookies--alas, with out the mesquite flour. I guess this all sounds pretty decadent but it is also so healthy--I've got white whole-wheat flour back in my pantry, as well as big and beautiful Corona beans, whole-wheat pastry flour, and amaranth flour. I look forward to working my way through this cookbook and making the changes in my diet that will allow me to continue to feast on Central New York's bounty while getting myself in better shape to run the Boilermaker 15K in July. It's a total win-win. Thanks Heidi! Archive Alert: On this date in 2006 I was pondering the merits (or lack thereof) of reviewing the Olive Garden.